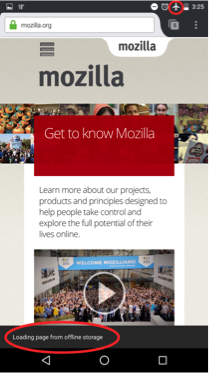 We are testing a feature in Firefox for Android Beta that will display some Web pages even when you’re offline. If you’ve recently visited a site and it is still cached in the offline storage on your device, Firefox for Android Beta will display the stored offline version of the page instead of showing you an error. There’s no need to do anything to try this feature. You’ll notice that some pages you visit when you’re offline will still be displayed in Firefox for Android Beta, even when you aren’t connected to the Internet.